My first animated piece for the New York Times was called Hi! I'm a Nutria. It focused on the aquatic rodent the nutria, also known as coypu in Latin America or nutra-rat in the American south. The species is invasive in much of North America and was brought up from South America in the early twentieth century to be raised for it's fur. 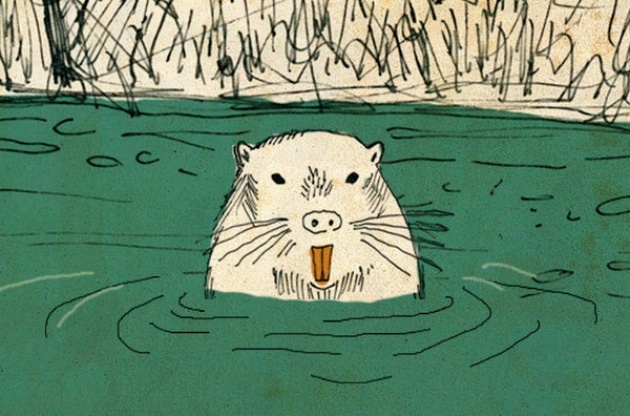 The piece is narrated from the point of view of a nutria living in Lake Washington, in Seattle. The invasive creatures were released into the lake back in the 1960's by local fur farmers who for various reasons had given up on the prospect of nutria fur farming. The Neiman Journalism Lab at Harvard wrote an article on the animation called "How a talking rodent is one of the pioneers of the opinion pages at The New York Times." Much of the piece includes research derived from the book Fur, Fortune and Empire by Eric Jay Dolin. I used the animation as a way to reflect the history of the fur trade in America, opinions on immigration and nativism and a few other issues. Issues that would have been much more dry and uninteresting if they had just been written down. Animation is the most effective way to communicate these sorts of ideas. Watch the piece here.